The Orinoco Oil Belt Assessment Unit of the La Luna−Quercual Total Petroleum System encompasses approximately 50,000 km2 of the East Venezuela Basin Province that is underlain by more than 1 trillion barrels of heavy oil-in-place. As part of a program directed at estimating the technically recoverable oil and gas resources of priority petroleum basins worldwide, the U.S. Geological Survey estimated the recoverable oil resources of the Orinoco Oil Belt Assessment Unit. This estimate relied mainly on published geologic and engineering data for reservoirs (net oil-saturated sandstone thickness and extent), petrophysical properties (porosity, water saturation, and formation volume factors), recovery factors determined by pilot projects, and estimates of volumes of oil-in-place. The U.S. Geological Survey estimated a mean volume of 513 billion barrels of technically recoverable heavy oil in the Orinoco Oil Belt Assessment Unit of the East Venezuela Basin Province; the range is 380 to 652 billion barrels. 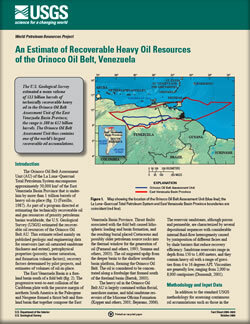 The Orinoco Oil Belt Assessment Unit thus contains one of the largest recoverable oil accumulations in the world. Schenk C.J., Cook, T.A., Charpentier, R.R., Pollastro, R.M., Klett, T.R., Tennyson, M.E., Kirschbaum, M.A., Brownfield, M.E., and Pitman, J.K., 2009, An estimate of recoverable heavy oil resources of the Orinoco Oil Belt, Venezuela: U.S. Geological Survey Fact Sheet 2009–3028, 4 p.